Welcome to a rather introspective post. Any of you who follow the Coalition of the Brave will know that I’ve recently had reasons to stop and think about how I approach debate and discussion, and about the nature of open discussion. There are questions here that I have no easy answers to – what is the Coalition intended to be, a safe space for like-minded people, a forum for honest yet respectful conversation between people with opposing points of view, or some sort of weird amalgamation of the two? Can one be both honest and sensitive to opposing positions? I strive to be mindful of how my words can impact others. A statement which is harmless to one person can be hurtful to another, so how a point is conveyed can be as important as what that point is. This doesn’t mean I’m not capable of arguing passionately and forcefully, though even then I try hard to avoid descending into outright aggression or rude behaviour. Even here I don’t always succeed, because I am a human being, flawed beyond measure. So was I right to hint that another site is something of an echo chamber, given the charge made against the Coalition? Am I a hypocrite? Yes, I am. You want to know something? I think we all are, in some way shape or form, at various stages in our lives. It’s human nature. We try to protect our own. There isn’t necessarily anything wrong with the question Paul asks, but the salient detail for me is that the tweet to Lambeth Palace wasn’t made altruisticly. It was (to use the expression I used during the discussion), ‘poking the bear’. If you’ve followed any posts on Blogging Theology (and if you check parts one, two and three of my dialogue regarding bakers and rights) then you may understand a bit more as to why I raise this point. The key thing I wish to stress here is that what Paul did is no different to an experience I had in town a few months ago. I was looking for a particular building and asked a guy (chosen at random) where it was. He started to talk about God and was preaching to me. It was unsolicited and uninvited, and not appreciated. Paul’s question (based on his personal religious position as a Muslim) had nothing to do with the question raised (which was about encouraging job applications). 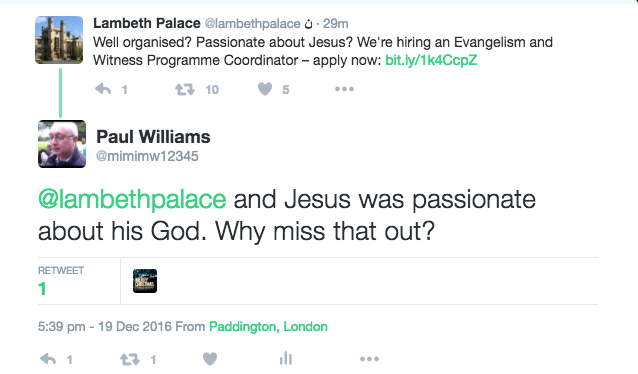 The only genuine connection between the Palace tweet and Paul’s reply is the name Jesus. I called Paul out on this, and it didn’t take long before he steered the conversation away from the subject and onto questions about why I hate religion and why I post on his blogs if I hate religion (basically, classic examples of leading questions). I asked him whether he wanted genuine discussion on his site, or whether he just wants people to agree with him. Paul has now decided to put my comments into a moderation queue and the last couple haven’t been published. On my own blog, and on the Coalition, I try to let comments through at every opportunity. I don’t like blocking comments or people and try to avoid it, though sometimes it can’t be helped. Nevertheless, my own comments to Paul regarding the apparent ‘echo chamber’ nature of the discussion he appears to want to cultivate there has forced me to look in the mirror. Does this invalidate what I had to say on Blogging Theology? I don’t think so. Nor do I feel I have been rude to him. Then again, I am not him, and I cannot therefore judge what he finds to be rude. All in all, the conversation has been interesting and enlightening, in more ways than one. Lots of people from all walks of life like to create echo chambers for themselves. It’s called confirmation bias. We are tribal by nature. However, some people resist tribes and ideologies. I try to be one of those people. I don’t think you’re wrong to call people out on it, and you’re entitled to your opinion. I find it hard to believe you’d be rude on purpose. I agree. The best we can do is precisely to take a step back and ask if we agree because what’s being said makes sense. That it plays out mathematically- based on evidence. If it doesn’t, there’s a problem.